Five minutes later, my heart skipped a beat when I saw this. It looked like a wolf. But it was only a log in disguise. I’m taking a break from the beach today. I have the luxury of living in two places. 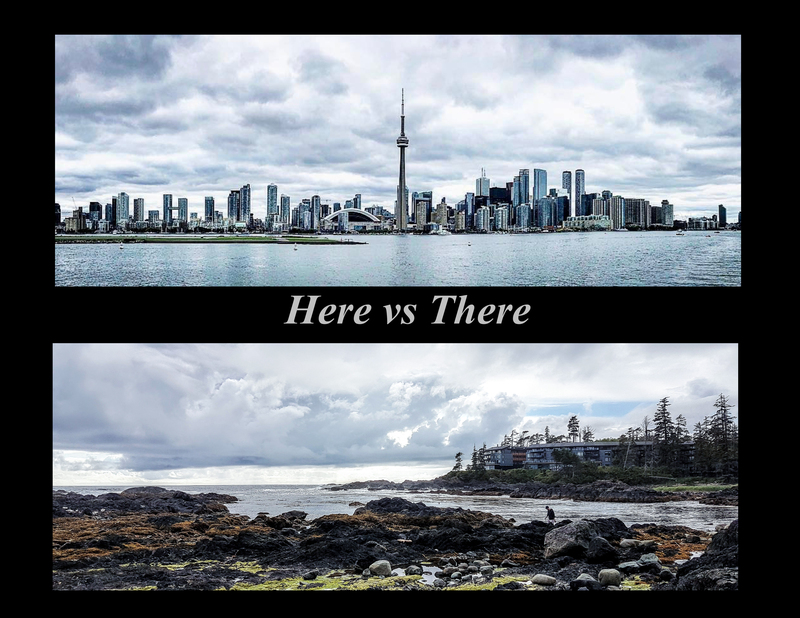 One is in Toronto, the largest city in Canada, population: six million. 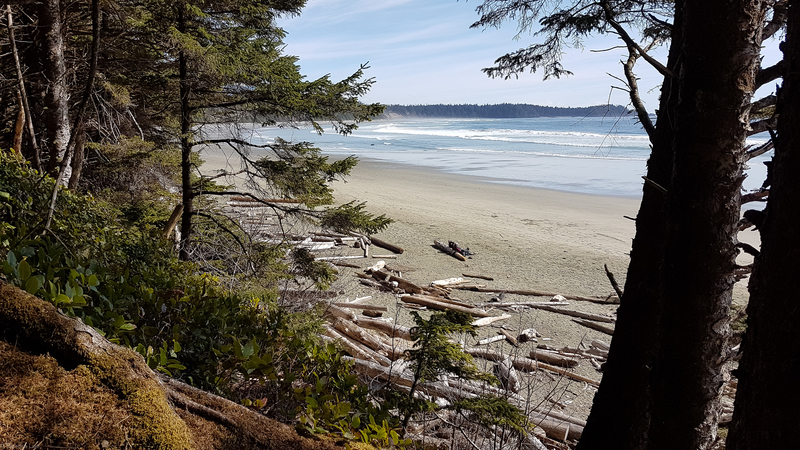 The other is in Ucluelet, population: 1,717. In Toronto I am never more than ten minutes from a super store; fine arts is a choice of museums away and dinner is easy with over sixteen thousand restaurants to choose from. 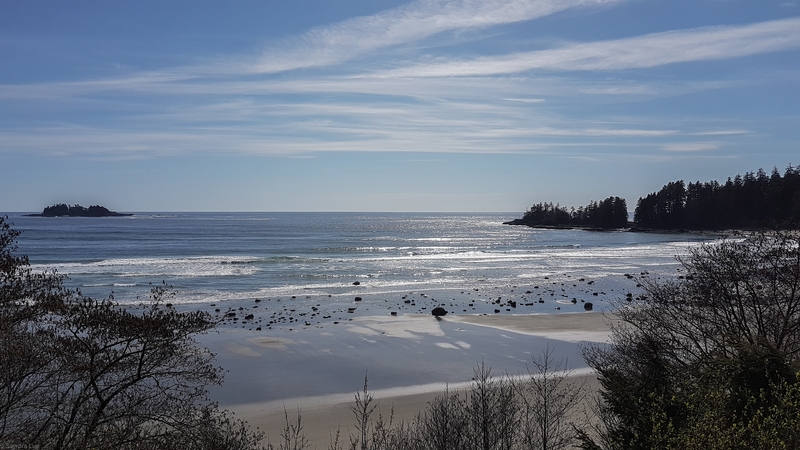 In Ucluelet, the nearest Walmart is two hours away, art is the view from my living room and I can have any food I want, so long as I make it. Transitioning from one place to the other takes planning. Whenever I come to Ucluelet, I have to adjust my clothing and gear. The weather is always one of sunny, foggy, overcast or mild. Sometimes it’s all of that in one day. In any case, there’s always the chance of rain. I wear layers under my waterproof jacket which has a hood and lots of zippered pockets. The pockets are necessary for storing my scarf, keys, sunglasses and bear spray. The zippers are necessary for when I catch a sun spot and have to de-layer to soak up some rays. If you’ve ever lost your keys on a trail, you’ll know why zippers are important. Probably the most obvious change in gear is my hand bag. In the city I carry a slouchy leather hand bag. It’s big enough to carry my wallet, phone, keys, hat, gloves, aspirin, notebook with a checklist of to-do items and a pen to check off old items and add new ones. In Ucluelet I carry a change purse with one bank card, a health card and Co-op membership. And enough cash to pay for serendipitous finds in the local thrift shop. Ahh, the west coast thrift shop … now there’s another difference between living here vs there. But that’s another blog post for another time. Stay tuned! I had a Tim Horton’s yesterday and it was so good! So why was my Timmie’s so special? It wasn’t just because the breakfast bagel was soft, the bacon crispy and the lettuce and tomato super fresh. It wasn’t just that the coffee was dark roasted with real cream or that the apple fritter donut was ooey-gooey sweet with a hint of cinnamon spice. Nor that this was the first stop after an early morning, two hour trip through winding mountain roads where I halted any car sickness by clenching my fists and biting my teeth. No, the reason it was special was because I haven’t been able to have fast food for four whole weeks. In my little town of Ucluelet and the nearby town of Tofino, there is a municipal ban on all fast food franchises. No McDonald’s, Burger King, KFC, Starbucks (gasp) or Tim Horton’s. Tell you the truth, I don’t miss them. Lower metabolism and higher susceptibility to gravity makes me avoid fast food. Normally. But nothing makes something more appealing than not being able to have it. On this day, I enjoyed my Tim Horton’s breakfast. And because I could, I had A&W burger & fries for dinner. 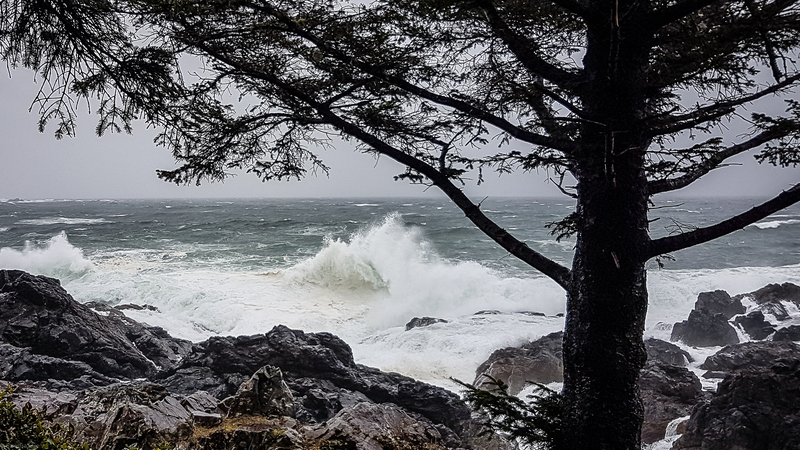 Environment Canada issued a severe wind warning for Vancouver Island yesterday. South West Vancouver Island (where we are) was hardest hit with 90 km winds and 100 km gusts. Although we were most exposed, our little town was unscathed. Elsewhere, BC hydro lines were knocked out and thousands were without power for hours. Wind storms make for spectacular viewing. At its worse, we watched from the safety of our house. When it calmed down, we went to Amphitrite for a closer look. There were other tourists and storm watchers there. It was easy to identify first timers – they wore woefully inadequate rain ponchos which flapped in the wind as they hurried back to their cars. Geared up in proper rain jackets, hoods and waterproof boots, we still got chilled to the bone. We wanted to see whales. 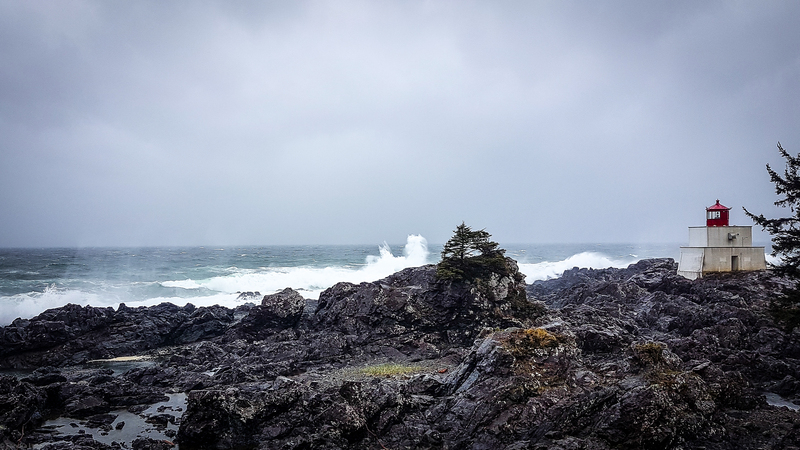 It was a foggy day in Ucluelet. At least it was on our side of the peninsula. On the harbor (a ten minute walk away) it was crystal clear. At Jamies’ Whaling Station, the group coming back from an earlier trip said they’d seen lots of whales. And so we went. We saw lots of this. But no whales. March is the beginning of the annual whale migration. During this time 20,000 Grey Whales move along the Pacific coast to their summer feeding ground in the Arctic. 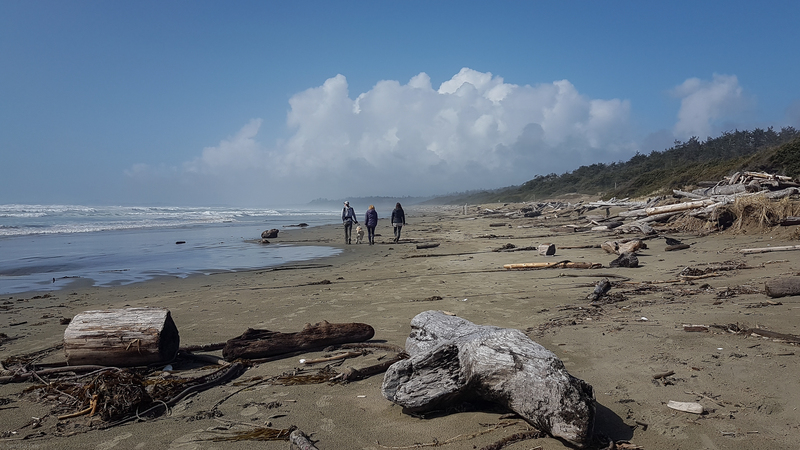 On the shore we can see evidence of whales by the flumes of water spouting in the distance. To truly see the whales, we have to get closer by boat. Unfortunately, the weather did not cooperate. Despite being crystal clear in the harbour, we were socked in by fog in open water, where the whales were hiding. We did see other wildlife. The Steller seal lions (shown here) are native to the North Pacific. They’re distinguished from the California seal lion by their look and sound. The Califorinians have a loud ‘ark, ark’ bark and the Stellers have a lower growl. Stellers have a lighter brown-blond colour and are much bigger, almost twice as big. The bulls grow up to 2200 lbs (~ 1,000 kg) and have a distinct ‘mane’ on their upper torso which the Californian do not have. We saw both types of seal lions. The Steller colony was dominating a rocky island, sharing space with a large group of sea otters, while the Californians hung out in the harbour. While we didn’t see the whales, we actually had an excellent day out. It was our first time on the water and it was wonderful to see the coast line and islands in Barclay Sound. Besides, since we hadn’t seen any whales Jamie said we could have another trip for free. We will be back! The Nuu-chah-nulth (pronounced noo-cha-nolth) are First Nations people who’ve lived along the coast of Vancouver Island for ages. 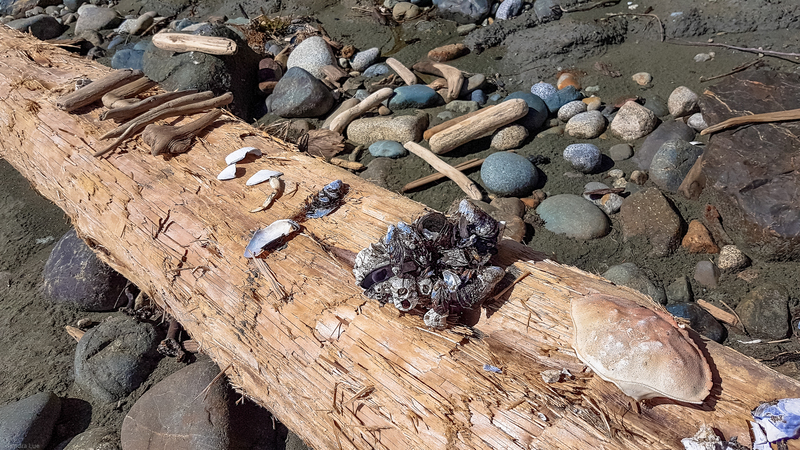 They have a story about the stones seen on Florencia beach. Thunderbird and Skate were playing a game. With total disregard for safety, they took turns throwing spears at each other. Thunderbird had the first throw which Skate narrowly avoided by turning sideways at the last minute. Then it was Skate’s turn. Thunderbird in a fit of trickery and bad gamesmanship, called down lightening and hail called kaacumin (pronounced cots-oo-min) to obscure Skate’s sight. Un-remarkably, neither deity was hit but the hail turned into stones which remained in the bay. The stones are reminders of the fickle nature of the coast. People are taught to never remove pebbles from the beach. Doing so might invite Thunderbird’s wrath and cause lightening and hail to fall. Today was sunny and beautiful. Having no wish to change it, I looked but didn’t take anything but these pictures of the beach. There are lots of reasons to look up when walking on the Wild Pacific Trail. The splendor of rain forest trees and strange obsession of people with locks. The danger of looking down is that it might lead to finding this. Grisly find by someone taking a walk. 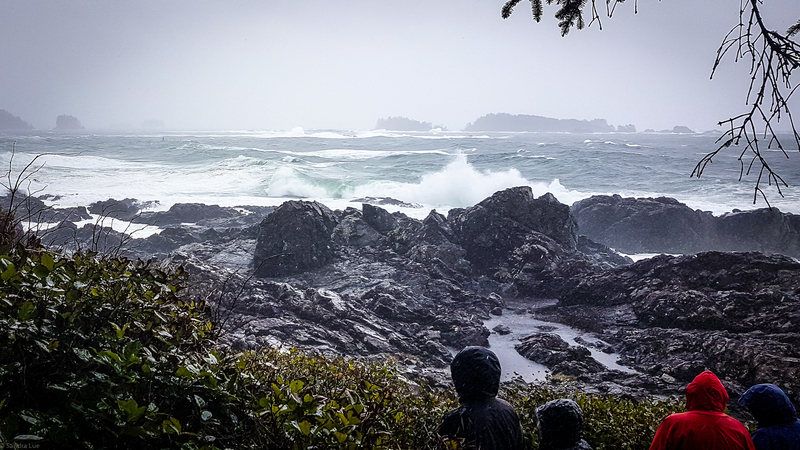 Image from Ucluelet Community Facebook page. There have been multiple reports of wolves out and about. Sightings and howlings at twilight and dusk. We don’t have a dog, so we’re not normally out then. It’s only the garbage that needs to be taken out at night. The threat there is for bears. They like to hang out near dumpsters for late night snacks. Of garbage, not people. But the bears haven’t woken up yet. And it’s hubby who takes out the garbage. He can toss bags better and further than me. He runs faster too. I woke up this morning is this what I saw. A sunny day outside – the first in a string of cloudy days. A perky sourdough starter – bread-ready after a week of feeding and nurturing. I had planned to bake bread today. If I go there would be trouble. If I stayed it would be double. The lyrics didn’t help with the decision. It’s official. We’re back, unpacked and set up. The sourdough starter’s been started. And my pickled Ham Choy¹ is underway. Everything’s in place … all the essentials of being home again. 1. A note about Ham Choy. This is less than scrupulous SEO plug. I have this other blog TheSandyFoodChronicles, for which I have a constant, steady and bewildering flow of traffic. It’s not that I post there regularly. In fact, I post there even more infrequently than here. No, the stream of hits is due to set of old posts on Ham Choy. What’s Ham Choy? It’s a type of sour pickle used in a particular style of Chinese cooking. Apparently, not a lot is written about Ham Choy but a lot people search for it. I make my own Ham Choy. It’s a mainstay of my pantry and an essential ingredient for making home-style comfort meals. It’s as necessary as … milk in mac n cheese, eggs in omelettes and ketchup on fries. In any case, my kitchen is not complete until I have a jar of Ham Choy on hand.